Look at how few people are at Ala Moana Beach. Yes, you have to get in your car or take the bus but if you look in the other picture you can see the Ala Wai harbor. This harbor is at the west end of Waikiki. So the only thing separating this beach from 10,000 tourists is a boat harbor. Go check it out if you have kids and don’t want to lose them in a sea of heads. 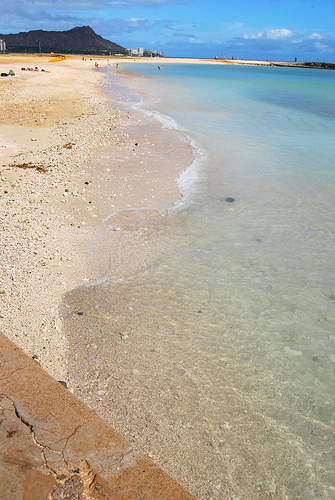 One of the finer, all around family parks on O`ahu, Ala Moana – which is Hawaiian for the Path to the Sea – consists of a beach and general recreation area of more than one hundred acres — when combined with the adjacent Magic Island – Aina Moana’s – thirty lovely acres. 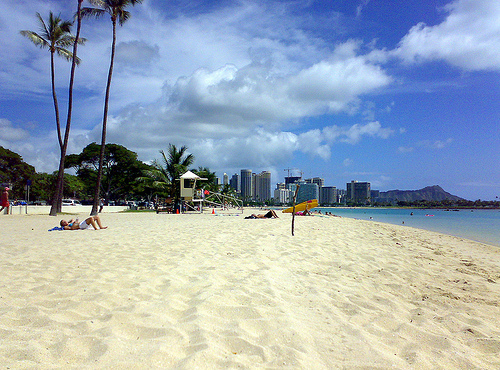 Ala Moana Beach Park is close to downtown Honolulu and across from the Ala Moana Shopping Center. Although the beach is not all that great, locals come here for the large picnic areas, tennis courts, and special events. The man-made Magic Island (which is actually a peninsula, not an island) attracts crowds on the weekends so plan your visit carefully. There is some easy swimming for kids here, but people mainly come here to picnic and spend a relaxing day outside. 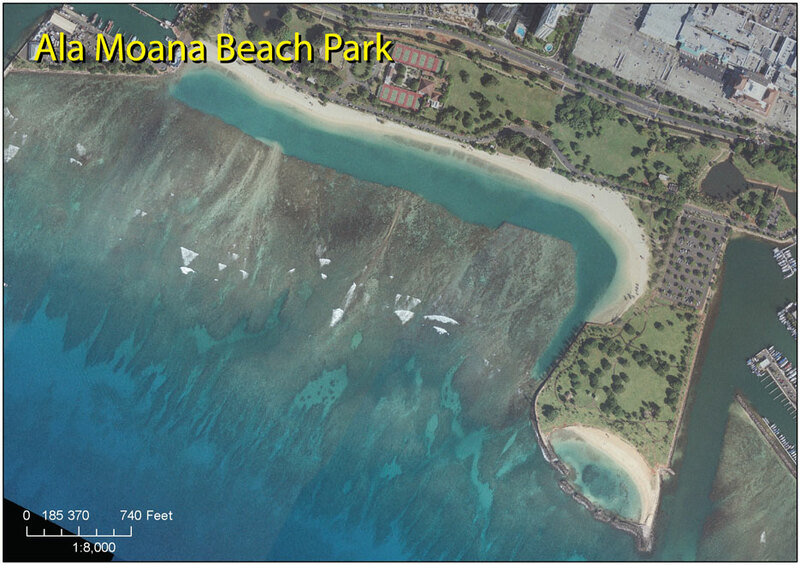 Ala Moana Beach OCEAN INFORMATION — For a detailed description of the Pacific Ocean’s marine climate, water properties, currents, tides, waves, etc., please visit The Ocean Atlas of Hawaii online. You’ll learn many interesting facts, like our average surface water temperature in Winter is 75 F (24 C) and 81 F (27 C)in the Summer.Call 596-SURF (that’s 596-7873) to hear a recorded message on conditions at various O`ahu beaches. The recording is a free service of the Surf News Network (SNN) and is updated four times a day, 365 days a year, at 7 a.m., noon, 3 p.m. and 7 p.m. In addition to wave heights, SNN provides information on winds, tides, and buoy readings.